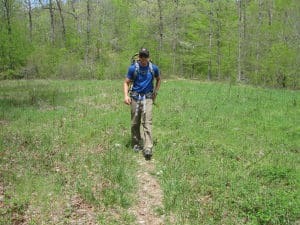 Adventure in a Backpack started back in 2011 on a 3 day backpacking trip around eagle rock loop near Mena, Arkansas. 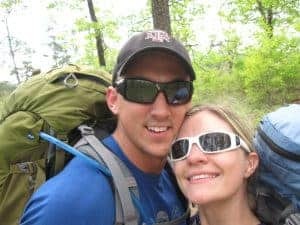 We wanted to start a blog to ‘metaphorically' bring our family and close friends with us on our adventures as if they were ‘in our backpack'. Very metaphorical. Seven years and 120,000 followers later, we were having…growing pains. Day by day, we liked the name Adventure in a Backpack less and less. It was too metaphorical. It was hard to say. The instagram handle @Adventure_in_a_backpack was a pain to exchange with curious individuals. 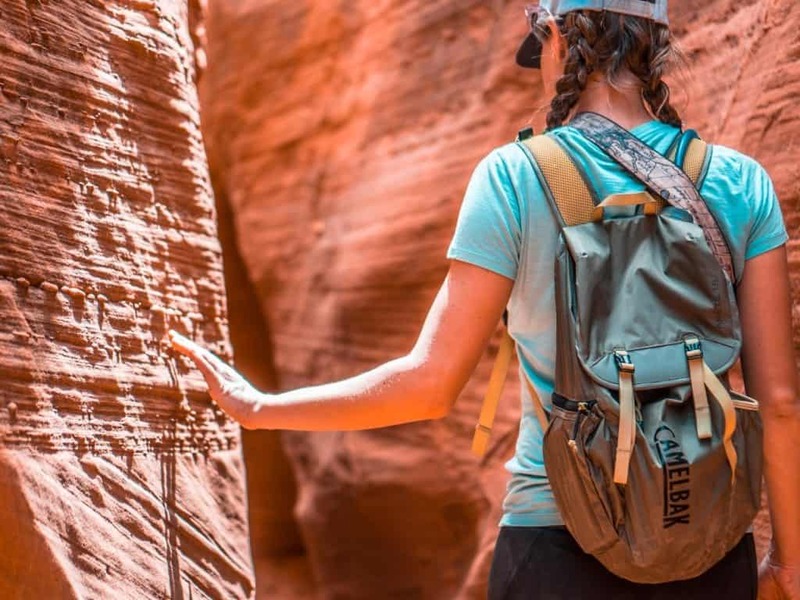 Contrary to the near daily inquiries, we aren't a backpack company. Sure backpacking is how we got our name initially, we haven't been on a backpacking trip in…admittedly too long. One of our dogs is 11 years old now and doesn't like to walk more than, well, as far as he wants, which makes overnights in the back country less than pleasant for us, and honestly, dangerous for him. Sure, we still have big aspirations of hiking the PCT, the AT, the Haute Route. But what we do is simply broader than backpacking. Guys…gals… let's get this straight. We aren't van lifers. 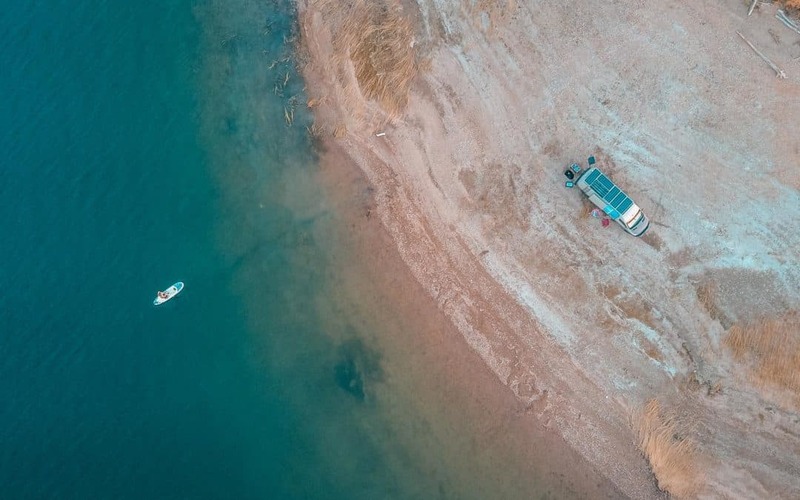 We never have been van lifers Living in a van is simply convenient for our lifestyle of wanting to be as close to all of our adventures as we can, and we definitely won't always be in a van. We may move back into a house. We may hostel hop for a half year in a developing country. We may move onto a boat. We aren't van lifers. Best beginner mountain biking in Moab. So, going forward… you're going to see a LOT more of that. We want to create the content that you enjoy seeing! It's more fun that way, for everyone. We fell into a bad habit of creating content at a rate we couldn't keep up with and you complained. We heard you. We needed less fluff in our content. GUYS…GALS…WE NEED TO SHARE THE STUFF YOU ACTUALLY WANT TO SEE. We've put out a few posts on how we make money, but we've never TAUGHT how YOU could make an income on the road. And that's exactly where our focus is going to shift soon. VERY soon. Actually, you can start now with that. Steph has already started writing and her first eBook about Making Money as a Digital Nomad is ready to go. Enter your email in the banner below, and we will send it over. PLUS, she's got 20+ business tips (short articles, really… and they are REALLY good. -Nate) normally reserved for her consulting clients that she'll send out over email over the next few months. You don't want to miss out on this. Put in your email and name below and get access to this FREE ebook, and be put on Steph's money-related email list. We are going to be ramping up with more DIY campervan content. Specifically in the solar realm. It's not ready yet, but we are developing the ULTIMATE “How to design your own solar setup” that's going to be really good, if I do say so myself. It's up to 20 pages and 4,000 words so far, and there's lots to go. There is nothing like it on the market that teaches solar in an easy-to-understand fashion without too much of the technical mumbo jumbo. We will be covering: How to size your system, How to determine necessary battery capacity, how to size your solar array to properly charge batteries, how to size a charge controller to your panels and SO much more. More about that soon. We've COMPLETELY reorganized our DIY Campervan Build section. Check out the menu at the top of the page, and browse around. We think that the new organization structure will help you find what you need about DIY van building MUCH faster. The Next Step is going to be making sure you are following along on all of our social channels. Each channel has unique content. Our newsletter is the distribution hub for ALL of our content. Signing up for our free newsletter is essentially subscribing to ALL of EXPLORIST.life. If you are signed up for this newsletter, you will receive an email every week (or every other week) with EVERYTHING we've been up to. If you don't like juggling different social channels and just want a compilation newsletter with links to the associated content, this is for you. This is where you will find build-guides, tutorials, how-to's. Our stats have shown that our Youtube fanbase wants to LEARN NEW THINGS and we love to teach, so this will be the platform for that. Instagram is all about the visuals. When we click into Instagram, we just want to see pretty stuff. This is where you can see some of our best pictures. We LOVE instagram stories. This is where you can see more candid, behind the scenes, day-to-day happenings. IGTV. This is a new one. It hasn't been live for very long. We are going to start putting out best adventure travel videos here. We've been asked on a regular basis to start a Patreon account, and we just haven't been ready yet. We still aren't quite there yet, but we are ready to start taking wait list names. If you're interested in supporting our videos and getting access to exclusive adventure travel videos, click More Info below. On our Facebook business page, you'll find a feed of our newest blog posts as well as photos shared from Instagram. Now, that doesn't mean that you don't need to follow us on Instagram, because we won't be posting IGTV videos or Instagram Stories to Facebook. But if you generally prefer to stay on Facebook, you'll still have great content to consume. Additionally on Facebook, we have TWO new private groups! 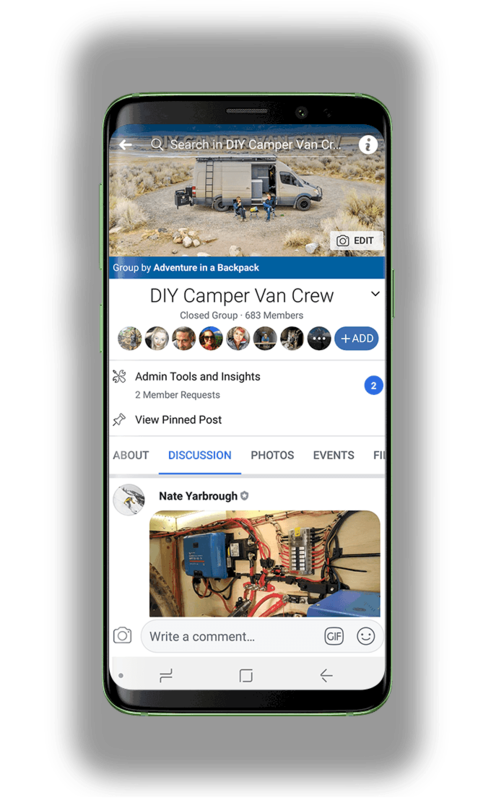 The DIY Camper Van Crew Facebook group is a private group run by me – Nate – and is focused around the build and informational topics of DIY Campers. This isn't limited to vans, though. If you have a camper, trailer, motorhome, Jeep, truck, car, whatever… and you just want to learn more about the build specifics that apply to you, come join! This is an informational and supportive group and we don't tolerate jerks. Not just for Camper Vans. Overland Trailers, RV's, Truck Campers, Whatever you use for adventure travel. Join our Exclusive community. The Unbound Explorist is Steph's new group. This is where she will be talking about all things money and business related, from money saving tips while traveling to how to start a new business that you can take on the road with you. She's giving actionable steps to creating an unbound income so you can break away from the chains of society and live your later life today. Sound like useful info? We thought so. Come join the group! 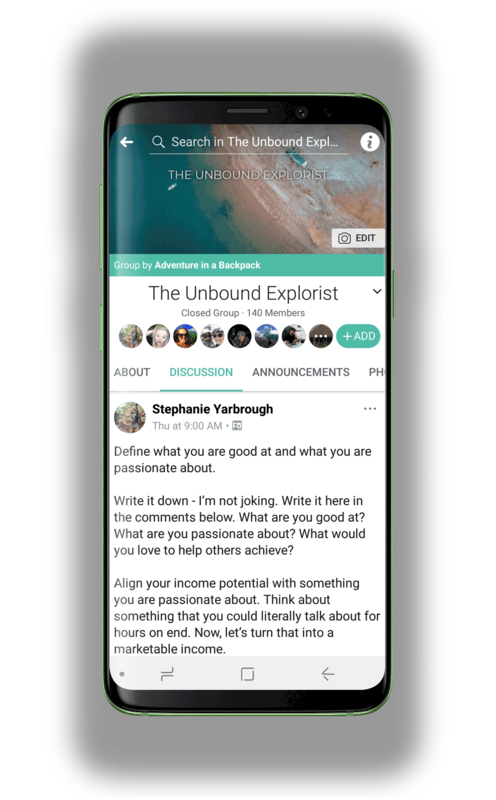 The Unbound Explorist is your hub for learning how to start your own business you can run from wherever you want to be. This is all about creating an income unbound by location and societal norms. Absolutely agree on all fronts. We actually have it in our plans to buy some land and build a house and shop for a base for more “Intentional Travel”. As our businesses have grown and the logistics of vanlife takes up so much time, we’ve realised that we’d rather be in a house for 3 months or so, get ahead on work, then hit the road for 2 months. We’ve also found that one of our biggest struggles in this lifestyle is not having a dedicated space to build things. We’ve both always loved building things from vans to furniture and this place we are building, it will be great to have a space for that kind of stuff.